Description: A very hardy plant often found in arid regions but widespread elsewhere as well. The long lancelike leaves contain a strong fiber. The flowerstalks contain many bell shaped drooping flowers. Edibility: Yucca root is a common food in central and south american cooking. The flower petals can also be eaten raw in salad or on their own. 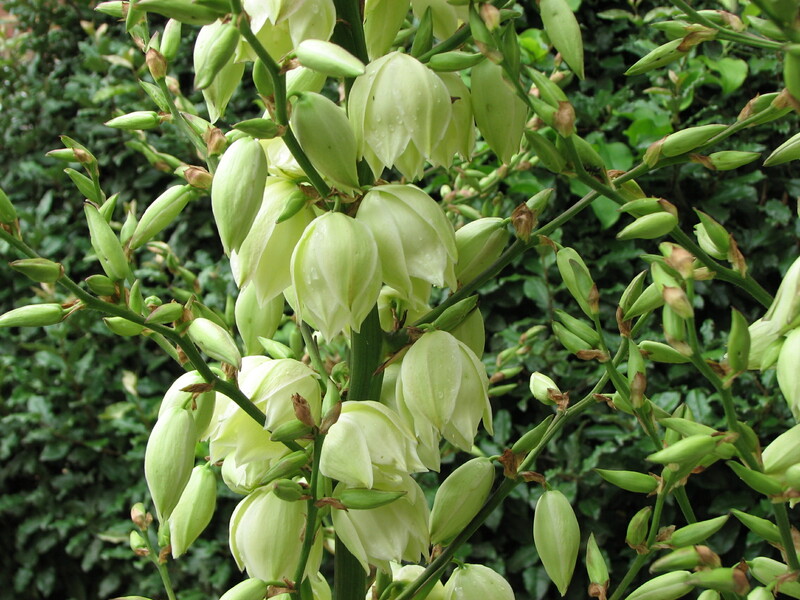 The fruit of some species of yucca can be cooked and eaten. Other species, however, have a hard inedible fruit. Habitat: Widespread, but thrives in sandy soil. Dense in desert or coastal regions. Medicinal: Unknown, but suspected medicinal uses. Utilitarian Uses: This plant is incredibly useful from a utilitarian standpoint. The leaf fiber is quite strong and easy to process, yeilding a fine cordage material. The dried flowerstalks make excellent hand and bow drill spindles and fireboards. The roots and leaves contain saponin.